After seeing some of his tweets this weekend, I asked John Cluverius, a Ph.D. student in political science at UNC-Chapel Hill (and former GW undergrad), for this guest post. Here’s what he wrote. But looking at only these Pew surveys—and attributing this shift to “Tea Party messaging”—are inconsistent with how scholars think about public opinion toward government spending and why those opinions shift. Pew does very good public opinion work, but we must be cautious about using a handful of indicators in occasional surveys as evidence of trends in public opinion . As election forecasters have learned, you can get more reliable measures by aggregating results from various surveys. The policy mood data show several key differences from the Pew data. 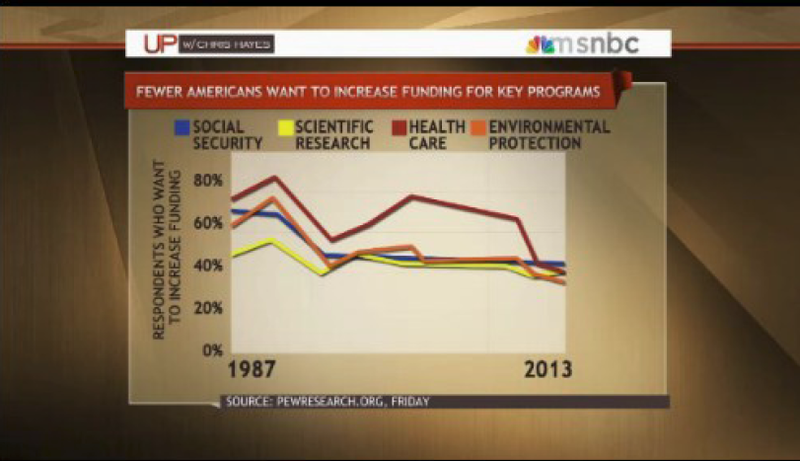 The series shows an upward trend in support for government programs between 1997 and 2008, not the decreasing trend in the Pew data. There is also a very narrow variance in the estimates since 1990; policy liberalism stays between about 52 and 62 percent in that time. While policy liberalism shifts frequently, these shifts are rarely drastic or permanent. Examining a longer trend also shows why we might expect the trend in the Pew data to be temporary. One of the key aspects of policy mood is that tends to react against prevailing government policies. Christopher Wlezien described this response as a “thermostat”: after the government does more and spends more, policy mood becomes less liberal; after the government does less and spends less, it becomes more liberal. This effect has been discussed in greater detail previously on this blog and others. In particular, the public’s policy mood responds to changes in party control of the White House. The public becomes more liberal during the administration of Republican presidents, and more conservative under the administration of Democratic presidents. What’s particularly interesting is that the health care spending question, which has been included in the most Pew batteries, shows the most thermostatic effects: drops in support for increased health care spending in response to debates about both the Clinton and Obama health care plans. Even if Americans are growing more skeptical of government spending, the change is smaller than the Pew data make it out to be, and it is likely a temporary response to Democratic governance. Watched the discussion on UP. Thanks for digging deeper. The interesting thing to me is eyeballing the average level of support over the years which I put at about 62%. Excluding military spending, which the GOP always strongly supports, this supports spending that is far above what the those on the right want. Norquist’s idea of drowning government in a bathtub certainly isn’t popular with the electorate. It’s pretty clear that liberalism trends up under Republican presidents, trends down under Democratic presidents at least for the first term, and then stabilizes and turns upwards during the Democratic second term. (This last statement has a very narrow base of support, since there was only one two-term Democratic president since 1952, but it was true for Clinton and looks like it might hold true for Obama.) 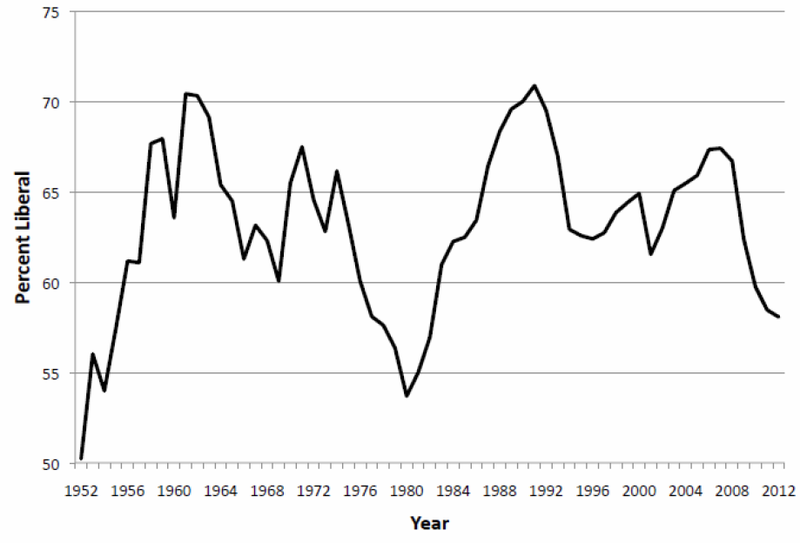 There’s no stabilization under Republican presidents: it kept rising for 8 years under Eisenhower, Reagan and Bush Jr. The only exception is that it tends to experience short-term dips after traumatic events: there’s a dip that’s clearly caused by 9/11, one that corresponds to the ’73 oil crisis, something complicated during the Vietnam War, and a big one in ’61 that I can’t attribute with certainty. I wonder if Professor Gelman is okay with the scaling of the Policy Mood chart. See, e.g., his objection to a Fox Business chart of tax rates. RobC: Don’t be coy. If you object to the scaling of the graph, say so and say why. Why coy? A chart that runs from 50% to 75% seems to me to exaggerate the fluctuations, but I’m not an expert in graphical presentation of data, Professor Gelman is. And he’s commented on it before. Maybe he sees a principled distinction between this chart and the one he criticized, in which event I’d be interested to hear it. Or maybe he’d be equally critical. Either way, his comment would be welcome. That’s not coy, it’s curious. RobC: Apologies for reading more between the lines than was there. My view is that it sometimes makes sense to “bound” the y-axis to the “natural” variation in the quantity. For example, we’re never going to have a presidential election where incumbent party gets 100% of the vote or 0% of the vote, so it doesn’t make much sense to run the y-axis from 0 to 100. Similarly, the public’s policy mood is also somewhat bounded, at least within the time period for which we have data. Don’t you mean between 57 and 67 percent? Could the narrower variation from 1990-present result, in part, from partisan polarization? Both uninformed liberals and conservatives think that government spending has gone up in recent years, though conservatives tend to believe it’s a lot higher than it is. So I’m not surprised to see a smaller percentage of people in favor of increasing spending. Conservatives never want more spending, except on defense. But when you pose the question to a liberal, even if he’s still quite liberal but maybe not to well informed, he might think that “well, err, we just raised spending on those things, maybe wait a bit and see what happens before we do it again.” If they believe their conservative neighbor when he says that Obama raised spending, they might think that’s fine but still say no to raising it again on short notice, even if the spending increase was tiny or didn’t happen at all. So objection to increased spending isn’t necessarily a sign of conservatism, but a sign that some percentage of liberals might be satisfied with current levels as they perceive them to be, and would support higher spending if they had more complete data.